We feel our surveys are quite unique, as they are written to your level of knowledge. As you can see from this article our surveys include photos and sketches as the feedback we have from our clients is that the sketches and photos help them understand the reports. The survey will also include an action required section and an estimate of costs in the executive summary. We can provide you with help and advice with regard to building surveys, structural surveys, independent valuations, property surveys, structural reports, engineers reports, specific defects report, home buyers reports or indeed any other property matters. We like to meet you at the property during the survey and we are more than happy to talk to you about the reports. Please free phone 0800 298 5424 for a friendly chat. 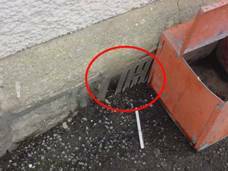 Whilst carrying out surveys we often come across dampness which can occur for several reasons, for example if the ground level is higher externally than internally or if the airbricks are blocked. 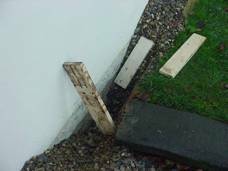 We often recommend a French Drain is added to resolve the problem. The French drain acts as an area to take away water that is directed at that area. 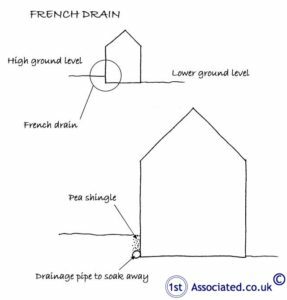 This can be a DIY job where a trench is dug around the property with a perforated drainage pipe and topped with pea shingle. We recommend that the drainage pipe is wrapped in a filter fabric to reduce blockages and that the pipe has a fall to the drain. 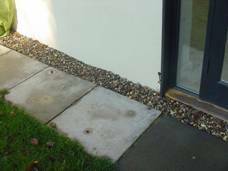 When is a French Drain used? 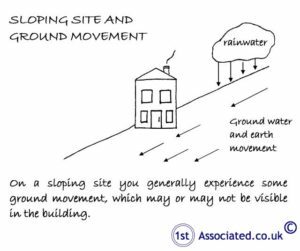 French Drains are recommended to divert water away from the building on sloping sites for example. 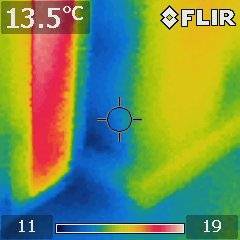 In this case our surveyors surveyed a property on a sloping site, where a patio was laid to the rear. 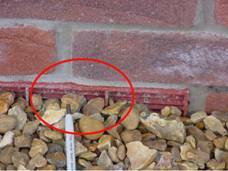 Unfortunately the ground level was not lowered which meant that the damp proof course didn't have the required 150mm (two bricks approximately) gap between the ground and the damp proof course. 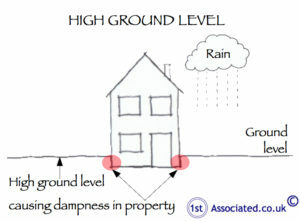 In theory dampness could therefore get into the property. 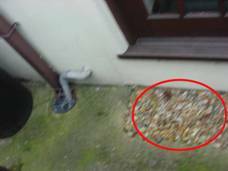 The way this is normally resolved is to put a French Drain in which is what was carried out to part of the house but not all. 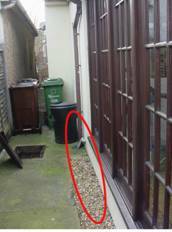 Having said that, we could see staining above the French Drain which indicated that the water is passing it and it may not be a proper French Drain. Water staining above French Drain. Is it a proper French Drain? 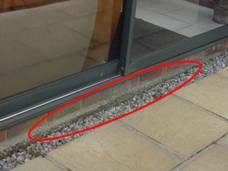 In this case we suggested that the occupiers monitored the situation and if it became a problem that they added a French Drain around the rear of the property to transfer the water to the front. 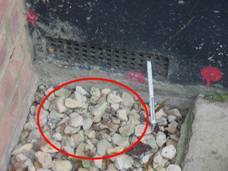 Be aware of nearby ponds, streams and high water table levels as these make French Drains not as efficient. 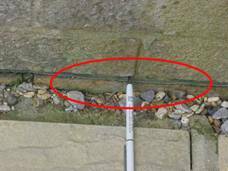 The photo below was a property surveyed by our surveyors where slabs had been laid resulting in a high ground level which meant that the airbricks were acting as gutters and allowing water to enter below the property. 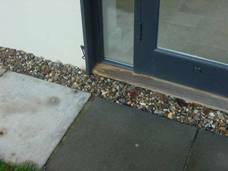 In this case we advised that the owners lowered the slabs, added a French Drain and protected the airbricks. 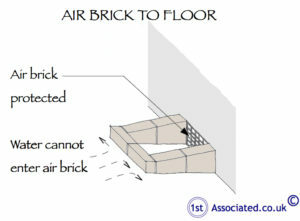 In a suspended timber floor, airbricks are essential to have a through flow of air as this helps to reduce the chances of wet rot, dry rot and woodworm. 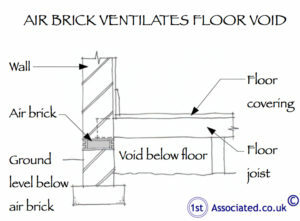 If the airbricks are blocked then problems will occur. 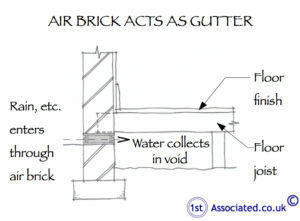 The airbricks need to be cleared. 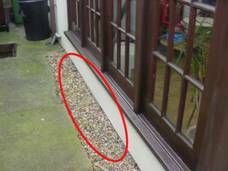 In this case a French drain had been added but it was partially covering the airbricks therefore it is essential that the ground level is lowered sufficiently prior to adding a French drain. 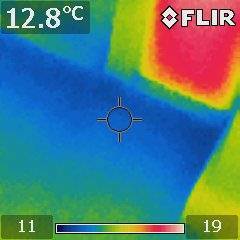 Using our thermal imaging camera we often find there is a damp floor caused by a high ground level or a French Drain not being carried out properly. Here we opened up a French Drain around a barn which was barely four inches of pea shingle before we got to the earth and there certainly wasn't a perforated drainage pipe underneath. 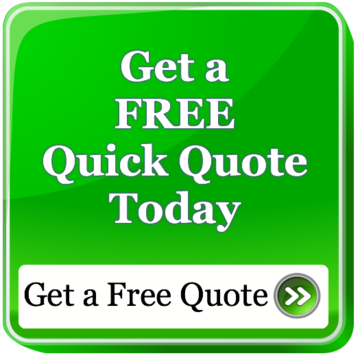 If you are experiencing dampness in your property and truly do want an independent expert opinion from a building surveyor please contact us on 0 800 298 5424 to have a free of charge friendly chat. We are happy to do valuations, building surveys, structural surveys, structural reports, engineers reports, specific defects reports, home buyers reports or any other property matters. If you are looking for commercial property, whether it is freehold or leasehold, we would recommend a survey as this will prevent dilapidations claims in the long run. You may wish to look at our Dilapidations Website at www.DilapsHelp.com and for Disputes go to our Disputes Help site www.DisputesHelp.com, both of which we have been advised are very helpful! The contents of the website are for general information only and is not intended to be relied upon for specific or general decisions. Appropriate independent professional advice should be paid for before making such a decision. All rights are reserved the contents of the website are not to be reproduced or transmitted in any form in whole or part without the express written permission of www.1stAssociated.co.uk.